I agree with the members of the Atlanta NAACP Chapter. All our historic confederacy related monuments should be destroyed…..
…and replaced with the names or likeness of today’s Americans who are victims of horrific CHILD ABUSE, NEGLECT, and MALTREATMENT at the hands immature moms and or dads who selfishly and irresponsibly introduce newborns, infants, toddlers, children and teens to a life of pain and hardship. Kendrick Lamar, born in 1987, won a 2015 Grammy for rapping out the depression he’s experienced since he was an adolescent. In a January 2011 LAWeekly interview Kendrick speaks about being SIX-YEARS-OLD and witnessing drug deals in front of his apartment. He talks about his ‘living wild” parents who deprived him of experiencing an “Average Joe” American kid childhood. Read Tupac ‘Dear Mama’ rap to learn about his love-hate relationship with his substance abusing mom, and his hatred toward his dad. Does he deserve to be an honored Victim of American Child Abuse? Let’s not forget about Shawn ‘Jay Z’ Carter, born in 1969, another victim of child neglect whose mother allowed a young Shawn to run wild on the streets of Brooklyn, NY, causing fear and emotional or physical harm to every peaceful person living or working in the Marcy Houses and surrounding neighborhoods. Since Tupac raps about his mom being harmed by drugs, thereby depriving him of experiencing a safe, fairly happy childhood, and Shawn Jay Z Carter raps about selling drugs to people like Tupac’s mom, should these two victims of child abuse and neglect have their images placed side by side on Stone Mountain State Park, smiling at one another? 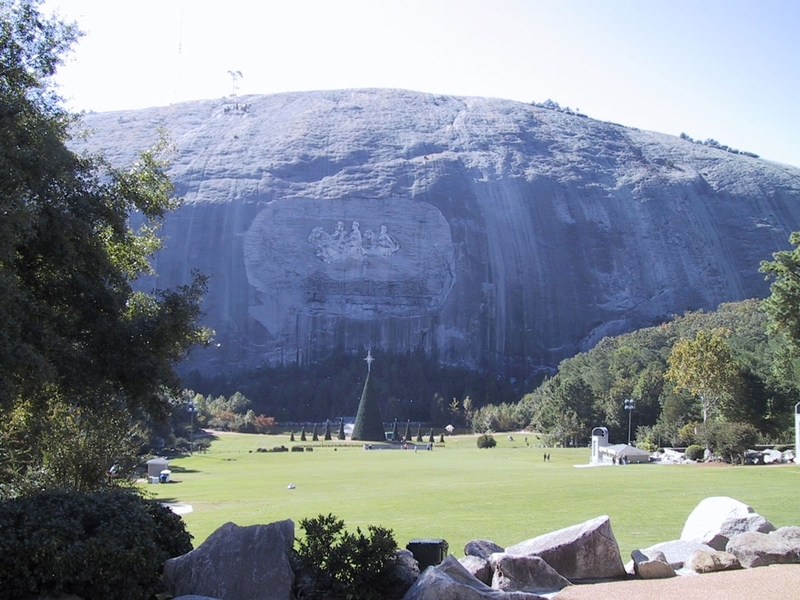 Is there room on Stone Mountain State Park to add a likeness of Baltimore Mom of The Year Toya Graham, who builds a large family she introduced to struggle and hardships, instead of being more responsible and having one or two children she could more easily care, provide for and supervise? I am not trying to be a wiseguy. Frankly, I am totally disappointed with many of my American neighbors who are WILLFULLY ignoring America’s National Epidemic of Child Abuse & Neglect that over the last three decades we have all witnessed threaten and harm many American children’s lives, depriving untold numbers of children from experiencing a safe, fairly happy American kid childhood. I understand why the confederate flag flying over government buildings was way out of line. For a substantial number of peaceful Americans it is a symbol of American oppression and greed that maliciously harmed and exploited many generations peaceful people. However, erasing all the symbols of our past human ignorance does a disservice to future Americans who will become part of our ever-evolving human society. I would argue raising children in loving homes that encourage children to learn about our world, and how we have evolved and continue to evolve as a species. Educating our kids about the atrocities of our past, using them as lessons learned for moving into our more peaceful future. Growing up in the 60s, I quickly became friends with Motown musicians whose music conditioned me to believe they are peaceful, generous, loving, talented Americans deserving of my respect and admiration. Every one of my Motown friends wrote music loving, respecting or honoring the maternal half of our population. Today when ten-year-old American kids wake up for school, they tune their radio’s into popular music written and performed by the children and grandchildren of my Motown friends who have a different view of the maternal half of our human population. I’m fairly certain most Americans with common sense realize why many of the children and grandchildren of Motown musicians, for the past thirty years characterize females in their rap art performances, our moms sisters, grandmas, daughters and aunts, as *itches and *hores, or less than human not deserving of respect. I respectfully ask all members of the Atlanta Chapter For The NAACP begin a national campaign to raise awareness and educate children, teens and adults about all forms of Child Abuse and Neglect that harm developing children and communities.